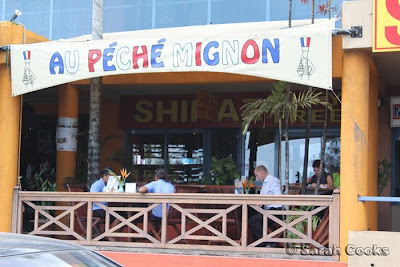 Au Péché Mignon was one of our favourite finds during our trip to Vanuatu, and we returned more times during out 10-day trip than I care to admit! 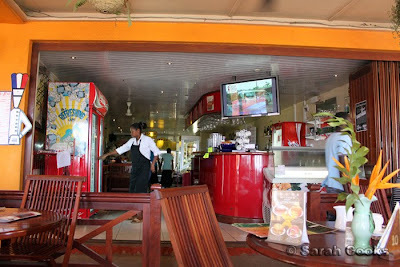 This very French café is located on Lini Highway, next to Prouds the Jewellers and opposite the Iririki island ferry. You can't miss it. Despite being previously colonised by the French (and the English) at various times, Vanuatu was a lot less French than I expected it to be. Even though everyone learns French and English at school, I heard very few people speaking French, apart from the few French tourists and expats that we saw. I think one of the factors must be the huge (and I mean HUGE) influx of Aussie and Kiwi tourists. 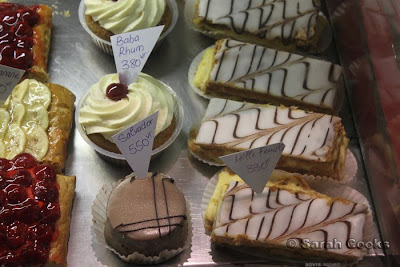 There are still French influences around (restaurants, cafes, shops, the Alliance Francaise), and I found that locals would respond in French if you were to speak to them in French. 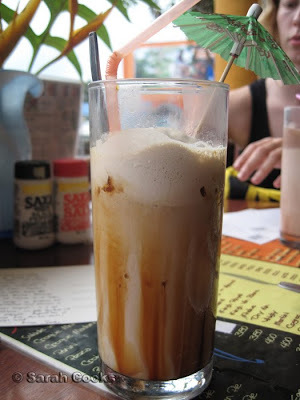 But anyway, back to the café! It's quite hot and humid on the inside, so I recommend grabbing a table on the balcony. 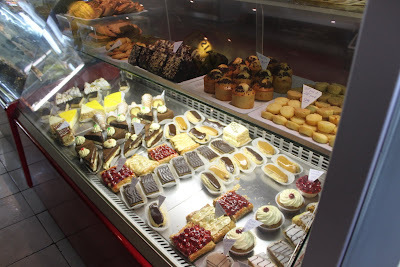 They sell drinks, ice-cream, a large array of pastries (individual and whole cakes), as well as crepes and baked savoury goods. Everything was so tempting and I had a tough time narrowing down my selection! 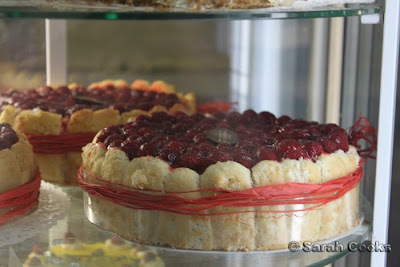 Now, let's have a close look at their cabinets..
Raspberry charlotte - made with local wild raspberries. 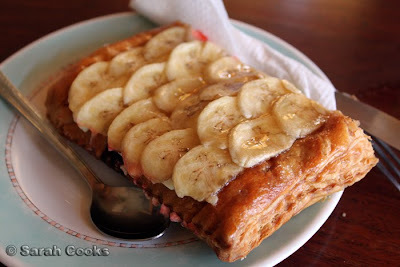 A banana tart is not the sort of thing I'd normally order, but we'd come across a photo of Au Péché Mignon's version during our pre-trip research, and I was fascinated. I am so glad I ordered it, because it was one of the most delicious things ever! 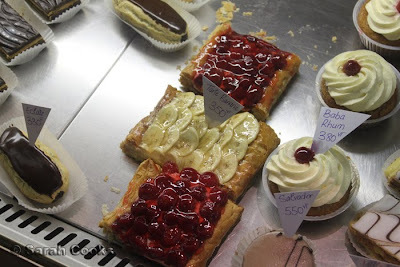 The pastry was literally the best puff pastry I'd ever eaten - so amazingly buttery and flaky! 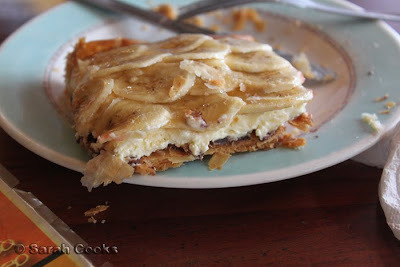 There was a thin layer of dark chocolate, fresh whipped cream and banana slices. Just amazing. 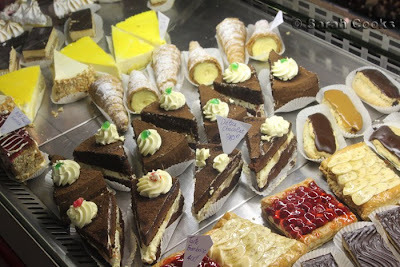 These photos are from a few different visits - no, I did not eat all of this in the one go! Ice-creams in tall glasses always make me feel like I'm on holiday! 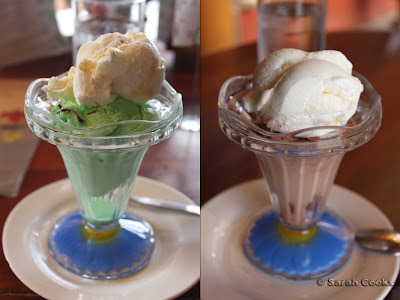 Their ice-creams were smooth and creamy - mint choc-chip was my favourite. 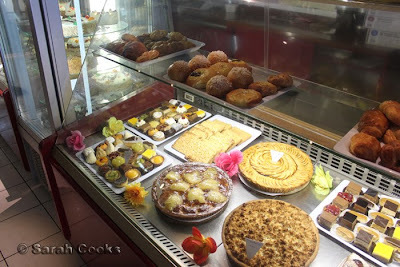 Bottom Right: Almond pave thing with biscuit on the bottom and crunchy caramelized almonds on top. I loved Au Péché Mignon - it's a lovely spot to sit and relax after a hard day (hah!) of shopping, swimming or snorkelling. And their food was wonderful! Just looking back over my photos is making me hungry again, haha. I can't wait to visit again. 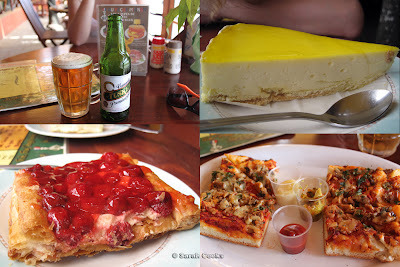 If I were a rich expat living in Port Vila (don't laugh, it could happen!) I could totally see myself ordering their beautiful cakes for fancy parties. But until that happens I will just be saving up for another holiday there. 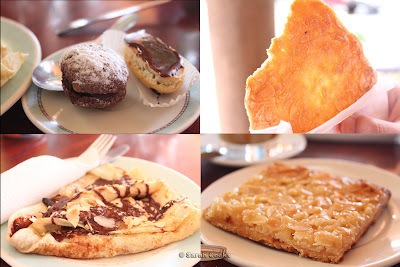 Count me in for the "almond pave thing" please :P Looks delicious!! Oh I know, crunchy sugary almond desserts are the best! Hey i know this place!! its my favourite too..i've been working there for like 6 months, when i was on holiday. Everything looks delicious. 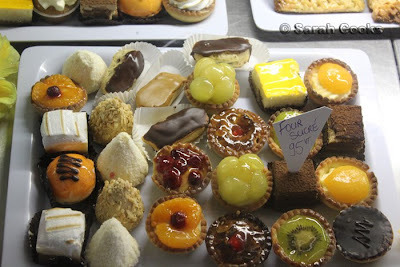 My favourite desserts are those petits fours sucres..